I am sitting in Beijing after spending 20 days in Southern China visiting my in-laws. I just found your blog and find it most timely. I am writing because I find myself so lost when it comes to the endless, dreaded family gatherings. My Mandarin is intermediate level and I’ve only travelled to China many times. Each time I come, I hope I can improve my skills but I am always disappointed by the fact that I almost never hear Mandarin, except on TV. Even more challenging is that while my mother-in-law is from the city, my father-in-law is from a bit further north in the province and he speaks a mixture of Mandarin, the city’s dialect and his local dialect. Naturally, we have so many family dinners and I am so frustrated by the use of one or more dialects at the table depending on the crowd and almost never Mandarin, except to me with strong accents. Please give me some advice on how to cope with the scenario. I am working on improving my Mandarin, so that will generally help, but I could sure use some advice based on your experience when your in-laws get together and just speak dialect. Lixifur, I’ve been there — the dinners at the family home where the local dialect flows as easily as the wine, and all the while I scratch my head as I can’t keep up with the conversation (or, for that matter, the drinking). Like you, I used to feel so lost, lost enough to bring it up with my Chinese husband long after those family dinners. I too wanted to connect with his family, but in that common language of Mandarin that we all could understand. One suggestion he gave me was to just ask them in Mandarin about the conversation, a sort of “Nǐmen zài jiǎng shénme?” (你们在讲什么?/what are you talking about?). Sure, it’s not ideal — after all, you’re still getting the short version of the conversation, and probably missing some of the cool expressions in local dialect; you’re also, in a way, interrupting the conversation. But as long as you do it politely and don’t interrupt too often (I usually do this when everyone’s either laughing a lot or talking with some real passion about something), then you’ll still end up getting something out of the family dinners. Here’s another thing you can do — just remind them to speak more Mandarin when you’re around. It might sound bossy to say this, but in reality they probably just forget that you need them to speak Mandarin. Think about it — this is their family home, and all the rest of the time when you’re not there, they settle into local dialect (or any other dialect they’re comfortable with) the way they probably dive into any of the local dishes set at the table. A little reminder might go a long way to getting you into the conversation — I’ve done this a few times, and it’s definitely led to much more Mandarin language at the table. Finally, don’t rule out what might be perhaps one of the easiest ways to get the family talking to you — ask them to teach you some local dialect (or whatever dialect they prefer). They’ll have to explain it to you in Mandarin anyhow, so it’s an opportunity to use your Mandarin. Plus, the more words you learn, the more you can connect with his family. My husband’s grandmother speaks almost unintelligible Mandarin, and that’s meant that even learning a few simple phrases and improving my listening (after years of hearing my husband speak it with his family and friends) actually brought us closer together. But remember, the table isn’t the only place to practice your Mandarin (and, honestly, sometimes when that table’s packed with a ton of people, it’s tough to practice anyhow). You can also polish your language skills one-on-one or in small groups between or after meals. I’ve had some of the most productive — and instructive — Mandarin conversations with my family when, say, I asked my mother-in-law about how to make pickled radish, or asked my father-in-law about the book he wrote about his ancestral home. In fact, sometimes such a conversation turned into an hour or two hours worth of talking in Mandarin, particularly with my father-in-law (so much so that I actually had to call it a night before him on more than one occasion!). What do you think? What advice do you have for Lixifur? I understand you well Lixifur. The same happens for me when ever I have dinner with my Cantonese boyfriend’s family, they always speak in the local dialect (a sub-dialect of Cantonese). Usually I have no clue what’s happening on the table and because I’ve met the family only a few times, I’m too shy to start a conversation. Luckily few months ago his mother visited us for a weekend and I got to talk more with her. Her Mandarin is quite hard to understand, but I’m sure that during time I’ll get used to it. I’d say…yes, definitely, and on the side, try to learn some of the local language (I use the term “language” because I do believe many of these “dialects” meet the standards of mutual incomprehensibility to be considered languages, regardless of how they’re referred to in Chinese). It won’t help for awhile, but after some time, it will, and being able to drop a few words of it here or there will help smooth the way for greater interaction. They’ll probably love it! And yes, you can do it. I’m not married to a Chinese or Taiwanese guy (I’m married to a foreigner), and I am still not fully fluent in Mandarin, but I’m picking up some Taiwanese. I’m not conversant, but I know just enough to show people that I cared to take some time to learn. In life and dinner table my family speaks a mixture of Russian and English. I think in beginning my brother in law had difficulties, but afterwards he picked up a lot of Russian. I think also that my sister has helped him out a great deal so he won’t feel left out when we lapse into Russian or English. Good suggestions though. I agree with Jocelyn about trying to learn some of your husband’s family dialect. Tell your husband you want to learn some in order to understand him, his family and the people in his town/ city. Since it sounds like you are very conversational in Mandarin, maybe it’s good to learn a few phrases or words in the dialect. Recently, even though my Mandarin is still basic, I was learning Chongqing dialect…only because some of my friends come from that city, I was learning for my story, and lastly I really want to visit that city some day. 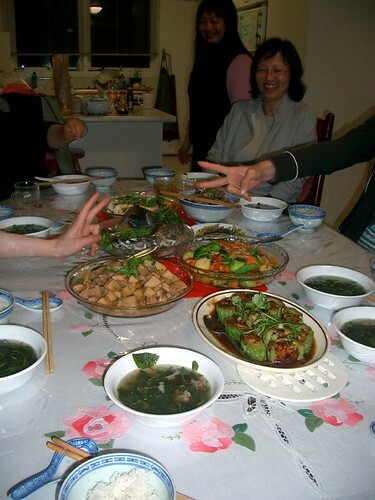 It is true that Chinese family members do speak their dialect among themselves. We speak hokkien among family members most of the times though we often switch between hokkien and Mandarin, and sometimes we even use some Cantonese and the hakka dialect. What we Malaysians called rojak language, a mixed bag. @Lixifur, I can understand that you feel left out . But like Jocelyn suggested, why not ask what they are talking about and maybe learn a few words or phrases in their dialect. You will sure impress your in-laws and the extended family and this will bring you guys even closer. You don’t have to master the local dialect your in-laws use though, because outside of the family, most Chinese would converse in Mandarin with each other anyway. Holly(Jiaqi) Your blog is very cute …Young people would speak Mandarin …..I do not think you need to learn the Chongqing dialect …. But if your boyfriend or girlfriend Chongqing People Can learn…… Like Chongqing, most of the low In Chongqing, are you reading?…….. I agree with Jenna about swearing in Taiwanese but yeah, not so great for the dinner table. xD Although, I made a really dirty joke in Taiwanese and got people laughing…but that’s another story. Its not uncommon when a clan of people talk their own dialect each other when they feel comfy to do so. Like when I was very new in Australia back in 2005, I made lots friends from the language school n picked up some Portuguese, Spanish, German (mostly bad words) instead of English as results of hanging out with them. Then I decided to go n meet some local that made me learn some English but until today I still find its not always easy especially when they talk each other in very Aussie slang or in their own accent. But my advise is don’t be shy to ask them to use general words or explain what do they mean. 入乡随俗. I agree that learning a bit of the dialect is probably the best approach. This is actually a good thing. If you learn to speak in a dialect, you can actually become a lot closer to the family. Lixifur, if you have children, you must make sure that they know how to speak the dialect. It can be their secret communication tool. Cheers ! My American wife has the same issue even my friends and relatives speak Mandarin. When we visit my friends or relatives, it is a dreadful experience for her — she calls it Chinese soap-opera, for hours. The problem is not only the language itself, it is also the context and culture that is difficult for a person who didn’t grow up in that society. I have been to the US for many years, and during early years, I felt lost when I was in a group conversation, when people were talking about music, movies, and pop-culture related topics. I found it much easier if I had one-on-one conversations. Usually, people speak other dialects can speak some Mandarin (depending on the age and education), so you should be able to communicate with quite a bit understanding if you talk to them one on one. These family dinners/lunches are tough situation for non-native speakers. Another idea is, if there are children around, try to play and talk with kids, it would probably be more fun than listening to those never ending Chinese soap operas that you have no clue about :). We have all been there before in these cross-culture communications. Don’t know what to do and tried to smile as often as possible. After a while your mind shut down because it hurts. It makes you feel useless and lack of intelligence. Ask your guy to prepare you before these dinners as much as possible. Try to know who are people there and what dynamics on the table (e.g. seniority). You won’t be able to speak the language in such as short time, but doing some homework beforehand helps. In US, pop culture matters a lot. In China the daily challenges are frequent conversation topics such as housing, marriage, children, and school. Try to initiate some conversations related to these topics. Once they feel you understand their culture, you will become one of them. People will be more willing to open up to you afterwards. Another big thing to keep in mind is that Chinese culture respect the people who is talking especially if that person is more important. If you can be a good listener, you already won half the battle. I think it’s pretty obvious that I don’t consider Taiwan to be a part of China – the thing about swearing in Taiwanese is that, not at the dinner table, but in appropriate situations, it’s not as “bad” as doing so in Chinese, even though the actual language is far worse…because the culture is just so much more informal. Oh, I don’t talk dirty on a daily basis or anything. Period. It was just between very close friends in a very private matter. xD My Taiwanese friends were much worse with their sense of humour. I would never blurt out obnoxious things out in public or even at the dinner table with family members. It’s just not how I roll. My fiance is from Shandong province and I am so happy because most of Rizhao dialect is incredibly similar to Mandarin. With only some tone changes and what not. So at my worst I can guess what some stuff means and I am fine. Thank goodness to cause her grandparents (who raised her do to her parents being lost) are who raised her and who I needed to ask for permission to marry her! I love reading your posts and hope to be able to post more comments! It is how I roll! I have a terrible mouth – and a terrible attraction to learning the worst of every language (and the best – I’m fascinated by Chinese idioms even though there is plenty more utilitarian vocabulary I could, and arguably should, be learning). I’d say it’s because I’m a New Yorker, but not all New Yorkers are that bad. So I have to work to keep it in check. Living in Taiwan is a great from this angle, though, because it does afford more opportunity to learn and (very rarely) use colorful language. Mandarin has some colorful language, too, but it’s not nearly as expressive and I was starting to feel a bit stifled in that language. (And, honestly, culture: I love learning Chinese but I was not terribly happy living in China – the sexism and lack of freedom was killing my soul. Moving to Taiwan was the best decision I could have made – more informal, freer, still not free of sexism but a whole lot better). I think that my enthusiasm for swearing in Taiwanese is sort of a sign or internal metaphor for that entire perspective. Dialet is not my favorite topic. I can understand several dialets but I refuse to speak any except the one that is the only thing my grandma understands. Dialet is a dying language, if you can call it a language. I don’t see the value of it except for short term usage for olderly. I forgot, or rather purged, the village dialet after my grantma passed away and made room for other things since my brian is small. Sorry grantma, I hope you forgive me in heaven. Thank you Yangxifu and everyone else for your suggestions and comments. You’ve all given me reassurance that my situation is normal and expected. You’ve also made some good suggestions on how to manage the family dinners. I will use these tacticts on my next visit. The point about pop culture is very well made and gives me additional motivation to expand my study of Mandarin to include media sources in addition to traditional Chinese language learning books. @Cvaguy, dialects may be dying. But is also because, as in Singapore, the government is discouraging the people from using dialects in their daily conversation. I think this is not wise. Dialects like languages, even if you can’t accede to calling dialects language, are more than just a means of communication. They are part of your roots. And if you lose your roots, it is quite sad. And nobody’s brain is too small for anything. I feel sorry to you Lixifur, and it happens even within Chinese people. I am from Hong Kong and my mother language is Cantonese, and I sometimes hung out with some Mandarin Chinese speaking friends in Australia cause I was studying in there. When I speak Cantonese to my Cantonese speaking friends, I didn’t try to isolate my Mandarin speaking friends- it is just the way how Chinese people work. As you know China is a big country and due to some historical reason, we have different dialects until these 50 years we tend to speak Mandarin more. We feel closer when speaking dialect to someone, it was not meant to isolate or alienate anyone. It’s par for the course unfortunately. My scenario was the Shanghainese just flying all around the room. I took it personally in the beginning, but the only person in the room upset was me — so I took it in stride. Walking in their shoes, it would like if I was forced to speak in a new language just for the sake of a visitor – it would be very tiring — so I understand more. Actually you will find Mandarin is some ways is a minority language – every province will integrate Mandarin second after their own local dialect. I’m Chinese and I even have to learn several local dialects. Just laugh about it and joke around more often and slowly you will be comfortable and speak it.